The supposedly indestructuctible slot machines, turns out are prone to failure like any other machine. 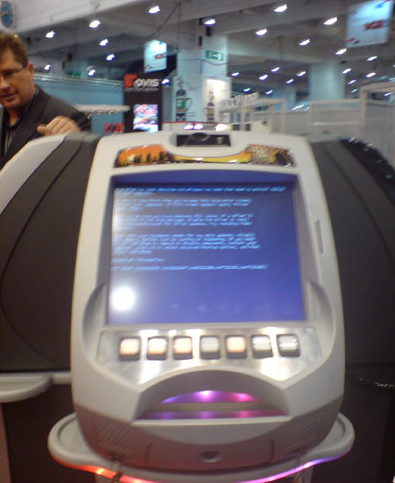 The inquirer reports this Blue Screen of Death on a slot machine at the International Casino Exhibition in Earl’s court, London. The machine was built by Italian Motherboard maker Zest, demonstrating its latest “high-reliability” computer designs. The machine was built on a 800MHz Celeron M processor and the 852/855 chipset with complicated RAS functionality built in. However the 22 large elctrolytic capacitors on the power circuit might be throwing off the viability of its design.